Saw Palmetto (Serenoa repens)* 110 mg Prevents the conversion of testosterone to dihydrotestosterone (DHT). DHT has been implicated as a cause of prostate enlargement. African Pygeum (Prunus africana)** 80 mg Reduces swelling and inflammation of the prostate. Nettle (Urtica dioica) 85 mg Reduces swelling and inflammation of the prostate. Job’s Tears Coix lachryma-jobi 110 mg Supports the kidney and urinary tract. It inhibits thegrowth of cancer cells and has antibiotic effects. Cuscuta chinensis 50 mg Supports kidneys and prostate. Polyporus umbellatus 90 mg Adds tone to bladder and increase urine flow. Also reduces inflammation of the prostate. Cellulase 20 mg Breaks down the cell wall of each herb and increases the release of active ingredients. Indications: Benign Prostatic Hyperplasia (BPH) or enlarged prostate gland. Suggested dose for adults: 1 capsule 3 times daily with meals or as directed by your health care practitioner. 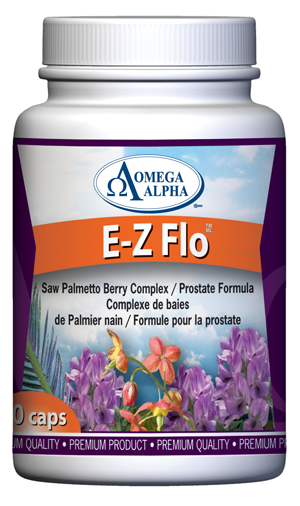 E-Z Flo is manufactured to strict GMP standards. It does not contain artificial colours, flavours, sweeteners, preservatives,chemical additives, wheat, yeast or animal derivatives.